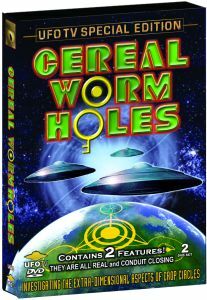 In 'Cereal Worm Holes', a UFO TV Documentary on Crop Circles, we are taken on a mind bending journey through the worlds of science, secret art and alien states of consciousness. For thousands of years an alien presence here on Earth has made us aware of their existence through miraculous signs and wonders, such as the ancient Nazca Lines of Peru, the Sphinx and Pyramids of Egypt, Stonehenge in England, and now, the global phenomena of Crop Circles. 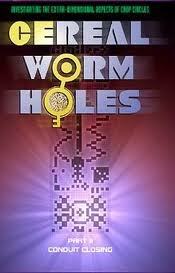 Presented here for the first time in this explosive program are the details of an investigation into the extra-dimensional aspects of the Crop Circle phenomena. Now drawing on shocking new discoveries from the world's greatest scientific minds, this epic set of programs presents factual proof of alien influences today that have shaped history and human evolution for thousands of years. Includes spectacular cinematography of alien Crop Circles and an amazing series of spellbinding interviews with researchers, experiencers, and the best known most credible Crop "Circle authorities in the world today. Ultimately your perception of reality will be turned inside out by the facts presented in this amazing program. The 777 Aum/Om Crop Circle : Eastfield, Wiltshire ! Crop Circles & Cymatics : Frozen Music !